Washington Capitals‘ defensive prospect Chase Priskie was named a top 10 finalist for the Hobey Baker Award, given to the player of the year in the NCAA, the league announced on Wednesday afternoon. You can vote for the winner through March 31 here. Priskie, 23, recorded 17 goals, 39 points, and a +20 rating in 34 games for Quinnipiac this past season. The Capitals selected the defenseman in the sixth-round (177th overall) of the 2016 NHL Draft. 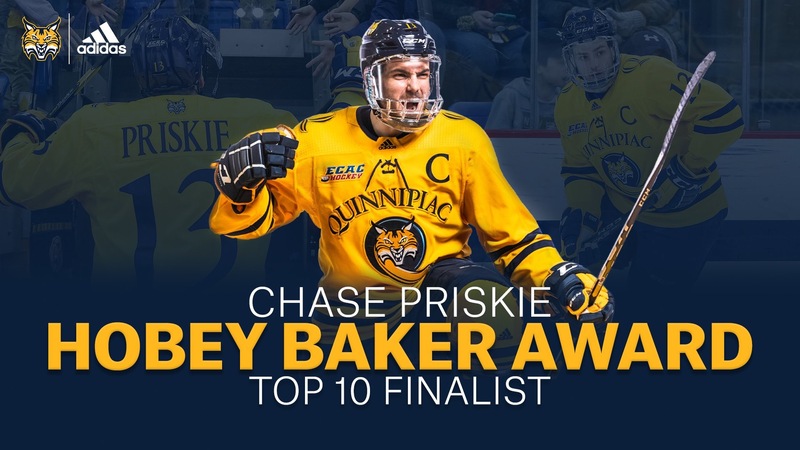 Quinnipiac men’s ice hockey senior captain Chase Priskie (Pembroke Pines, Florida) has been named a Top 10 Finalist for the 2019 Hobey Baker Award, as announced by the Hobey Baker Award Foundation on Wednesday, March 20. Priskie is one of three finalists from ECAC Hockey to be named a finalist for the award, as he is joined by Harvard’s Adam Fox and Clarkson’s Nico Sturm. The Hobey Baker Award is awarded annually to top NCAA men’s ice hockey player in the nation. In addition to their performance on the ice, candidates must exhibit strength and character on and off the ice, contribute to the integrity of the team, display outstanding skills in all phases of the game and show scholastic achievement and sportsmanship. The Hobey Baker Hat Trick Finalists will be announced on April 4 while the 2019 Hobey Baker Award will be presented on April 12 as part of the Frozen Four Weekend in Buffalo, New York. Priskie is just the third Bobcat to be named a top 10 finalist for the Hobey Baker Award as Reid Cashman ’07 reached the Top 10 in 2005 and Eric Hartzell ’13 was a Hobey Hat Trick finalist in 2013 as part of Quinnipiac’s run to its first national championship game appearance. Earlier this week, Priskie was named an All-ECAC Hockey selection for the fourth consecutive season as he was named to the First Team. He was a Second Team selection in 2017-18, Third Team selection in 2016-17 and an All-Rookie Team selection in 2015-16. He is also a three-time ECAC Hockey All-Academic Team selection. Earlier this postseason, Priskie was also named a finalist for the ECAC Hockey Best Defensive Defenseman Award as well as the Student-Athlete of the Year. Priskie has had one of the best seasons in the nation as he leads the country’s defensemen with 17 goals on the season while his 39 points rank fifth. Priskie also leads the nation’s defensemen with 132 shots on goal and 3.88 shots on goal per game. Priskie’s 17 goals this season are the fourth-most by a defenseman in the last 20 years, trailing only Colorado College’s Tom Preissing’s 23 goals in 2002-03, Minnesota’s Jordan Leopold’s 20 goals from 2001-02 and Wisconsin’s Justin Schultz’s 18 goals in 2010-11. Overall, Priskie is tied for the national lead with 10 power-play goals and is second with 23 power-play points. He is tied for 21st in the nation with 17 goals on the season. Priskie was part of Quinnipiac’s top power-play unit that ranks fourth in the nation at 25.9 percent on the power play and is on the top penalty kill that is also fourth in the nation at 87.5 percent. Priskie has already broke several program records this season, including goals by a defenseman in a career with 39. He broke the Division I program record with his 29th career goal on Nov. 9, 2018, before breaking the record of 38 goals held by Ed Muzyka ’86 with a pair of goals on Feb. 23, 2019. Priskie’s 77 assists are third among defensemen in program history while his 116 points are second. He also leads all active defensemen in career goals, power-play goals (24), and points while he is tied for third in assists. The Quinnipiac men’s ice hockey team awaits its opponent for the 2019 NCAA Tournament, which they will find out during the NCAA Ice Hockey Selection Show set for Sunday night at 7 p.m. on ESPNU. This entry was posted in News, Propsects and tagged Awards, Capitals Prospects, Chase Priskie, Harrison Brown, Hobey Baker, NCAA, Quinnipiac, Washington Capitals. Bookmark the permalink.